*Admission to the Chisholm Trail Museum, located across the street, is included. 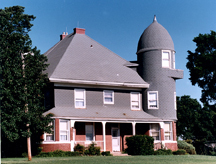 The A. J. Seay Mansion was built by Abraham Jefferson Seay (1832–1915) in hopes that Kingfisher would be the capital of Oklahoma Territory. Governor Seay served as the third territorial governor from 1892 to 1893. He built the three-story mansion named Horizon Hill for approximately $11,000 on fifteen acres of land just outside of Kingfisher, Oklahoma Territory. The mansion was completed in March of 1892 and hosted dignitaries present for the Cheyenne and Arapaho land opening. The mansion includes a reception hall, library, a ballroom, seven fireplaces, and a distinctive domed-roof tower. The A. J. Seay Mansion is listed on the National Register of Historic Places and is managed by Chisholm Trail Museum, Inc. Admission to the mansion also includes admission to the Chisholm Trail Museum located across the street. During museum hours visitors may also tour the Pioneer Village, which includes two log cabins, a one-room schoolhouse, a church, and one of Kingfisher’s first banks. Abraham Jefferson Seay had a distinguished career long before he was appointed the third governor of Oklahoma Territory. He was born in Virginia, but his family moved to Missouri when he was three years old. At the age of twenty-one, he worked on a construction crew of the Missouri Pacific Railroad to pay for his education. Later, he taught school and studied law, and was admitted to the Missouri Bar in 1861. Shortly after passing the bar and beginning his law practice, he joined the Union Army as a private to fight in the Civil War, ultimately attaining the rank of colonel. After the war, he returned to the legal profession and entered politics as a Republican. He served as a county attorney and as a circuit judge, operated a private law firm, and later became a bank president. When the territorial government for Oklahoma was being established in 1890, Seay was appointed associate justice on the Territorial Supreme Court by President Benjamin Harrison. On February 1, 1892, Seay resigned his position on the supreme court and was inaugurated as the third governor of Oklahoma Territory. His tenure lasted only sixteen months with one of his most significant achievements being the opening of the Cheyenne and Arapaho district to settlement. Seay was an enthusiastic advocate for the territory. To promote business investment and settlement, he encouraged the legislature to fund an exhibit for the 1893 World’s Fair in Chicago. During his administration, Governor Seay worked to raise funds for education. He also supported educational opportunities for African American children. Seay increased public school township sections lease revenue and helped secure funds for higher education facilities. On February 11, 1893, he signed House Bill 49 into law naming mistletoe the Oklahoma territorial floral emblem. It was the first commonwealth to name an official flower. On March 1, 1893, he declared March 16 to be Arbor Day in Oklahoma Territory. On leaving office in 1893, he returned to his home in Kingfisher where he remained active in business and Republican politics. He moved to California in 1909. Abraham J. Seay died December 22, 1915, and he was buried in Kingfisher. Governor Seay had never married. Visit The Encyclopedia of Oklahoma History and Culture to find out more about Abraham Jefferson Seay. The Oklahoma Historical Society Research Center in Oklahoma City houses the Abraham Jefferson Seay Collection (M2012.236, two legal boxes and one oversize folder). It contains his war diary from 1864, copies of correspondence, his last will and testament, and Seay family genealogy. The Governor Abraham Jefferson Seay Papers 1862–1916 are available on microfilm (Roll OHS-100) in the Research Center.